« How about a free Wu-Tang Clan track from their new album “Legendary Weapons”? What do you get when you take a couple of bands from the 502 and have them play with one the biggest bands from the LBC? Well, you have Louisville’s VilleBillies and Elephant Room opening for Long Beach, California’s Sublime with Rome. For those of you unaware, this is the new edition of the original Sublime from the 90’s. That show takes place this Sunday, July 10th at Iroquois Amphitheater on Louisville’s south side. Sublime with Rome is set to release their highly anticipated debut album with new frontman and guitarist Rome Ramirez. The new album is called Yours Truly and hits stores on Tuesday, July 12th via Fueled by Ramen records. 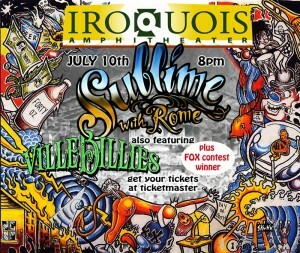 Rome, a 22-year-old northern California native, was introduced to the surviving members of Sublime, drummer Bud Gaugh and bass player Eric Wilson in 2008. Then jam sessions ensued, then a few impromptu shows, then an invite to a festival, then a Christmas gig for an LA radio station, then another big show – fittingly- on 4/20/10, and now here we are, a little over a year later and welcoming them to Louisville just before their new album release. Hunky-dory, right? So, this new solution is now officially known as Sublime with Rome. The music seems to emphasize a little more of the band’s affinity for the hip-hop style of alt-rock, more so than the original Sublime did back in the 90’s. They even have a collaboration song called “Can You Feel It” with hip-hopper Wiz Khalifa. They also still offer plenty of that signature Sublime-style of ska and reggae instrumentation and way of playing. Old school Sublime fans from the 90‘s; not to worry. You’ll be satisfied too. I’m sure they’ll break out “What I Got,” “Wrong Way,” or my personal favorite “Doin Time.” Hopefully, right? or by phone at 1-800-745-3000.